Does Your Pup Have Bad Breath? Try These 5 Tips! We love puppy kisses – what we don’t love is the dog breath that sometimes accompanies them! You don’t want to tell your dog to lay off the love, but you shouldn’t be gagging every time you catch a whiff of his breath. Bad breath is a sign that your dog’s dental routine could use a boost. Even if you’re getting regular cleanings at the vet, really great dental hygiene starts at home. Tooth brushing is the cornerstone of any good hygiene routine for humans and dogs. This is often easier said than done. If you can start training early, you can teach your dog to be comfortable with a toothbrush, but for others, a finger brush might be easier to manage. Use a toothpaste made for dogs – not the super minty stuff you keep on your counter- and brush thoroughly to remove plaque and freshen your dog’s mouth. 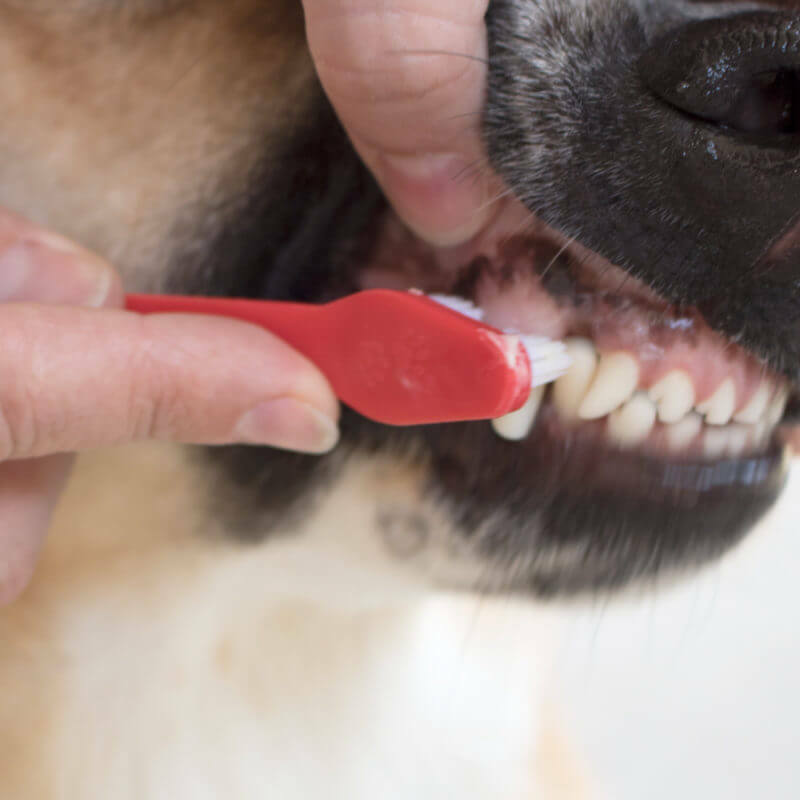 Many vets recommend brushing at least once a day, but if you feel that may be asking your dog for too much, twice a week plus a few quick cleanings with a dental wipe should keep his breath bearable. 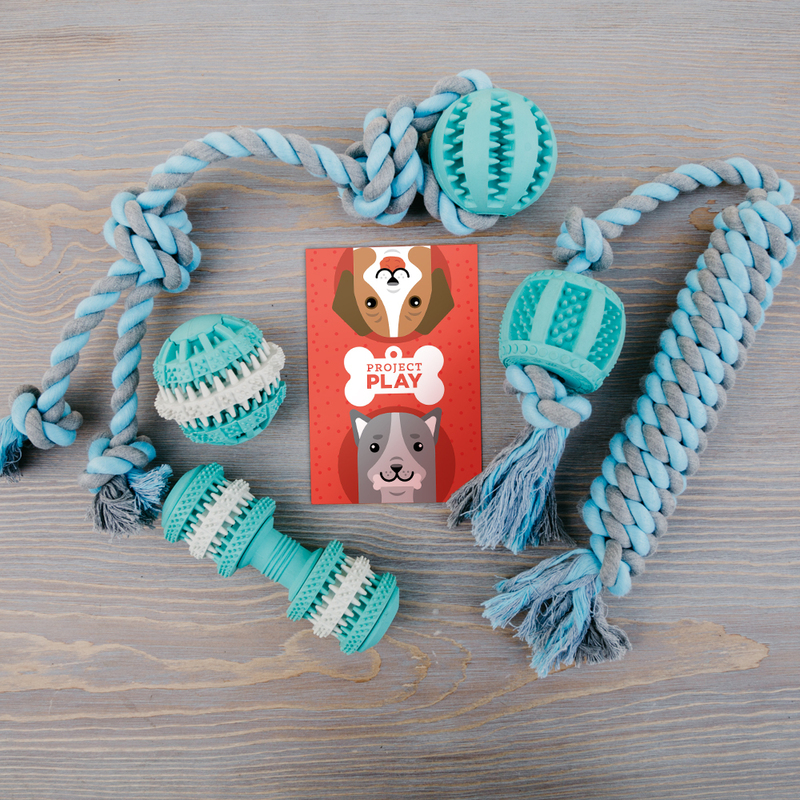 Chewing toys are the best for dogs who love to play! The next time your dog jumps up for a kibble-scented kiss, you can offer him a toy that’ll freshen his breath with no feelings hurt! iHeartDogs offers multiple mint-scented toys with rubber fingers that will gently remove plaque from the surface of your dog’s teeth and sneakily freshen his breath. They come in multiple shapes and sizes, so you’re guaranteed to find something the right size for your pup that he’ll love to chew. Does your dog come running when he hears the sound of food being opened? If you have the kind of dog that will bend over backward, sit, stay – anything you want as long as you have a treat in your hand – consider dental chews for his bad breath. 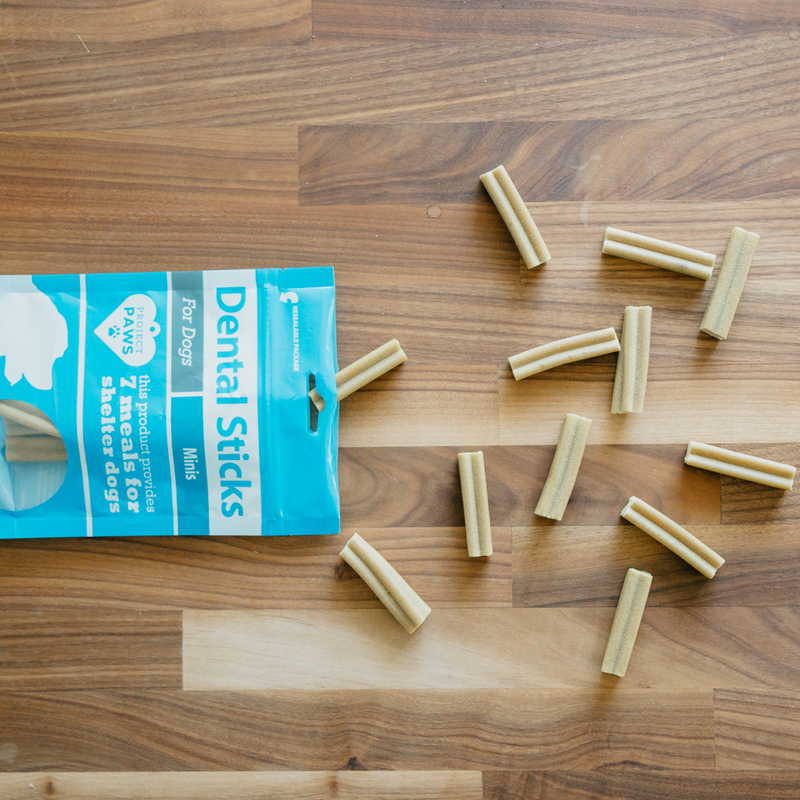 The texture of a dental chew will scrub your dog’s teeth as he chews it up, and the enzymes in Project Paws Dental Chews will help reduce the plaque his mouth that can hide tooth-weakening, bad-breath-causing bacteria. Dogs enjoy the minty flavor and it makes quick work of his doggy-breath. Has your dog’s breath become a code-red, all out emergency? It happens. The quickest way to take care of it might be a dental spray. A few quick spritzes will turn their breath from stank to sweet. Not only does Project Paws Dental Spray freshen your pup’s breath on the double, it also contains enzymes that reduce the build up of plaque and tartar on your dog’s teeth. We know we’re not supposed to, but when your dog is looking at you with those big puppy-dog eyes, it’s hard to stick to the rules when it comes to table food. Especially desert. Dogs love sweets just like we do, and it can negatively affect their teeth as well as their waistlines. The occasional Puppuccino, a scoop of ice cream here and there isn’t going to hurt much, especially if you’ve got a solid dental routine, but treating smart can help your dog live a longer, healthier life. 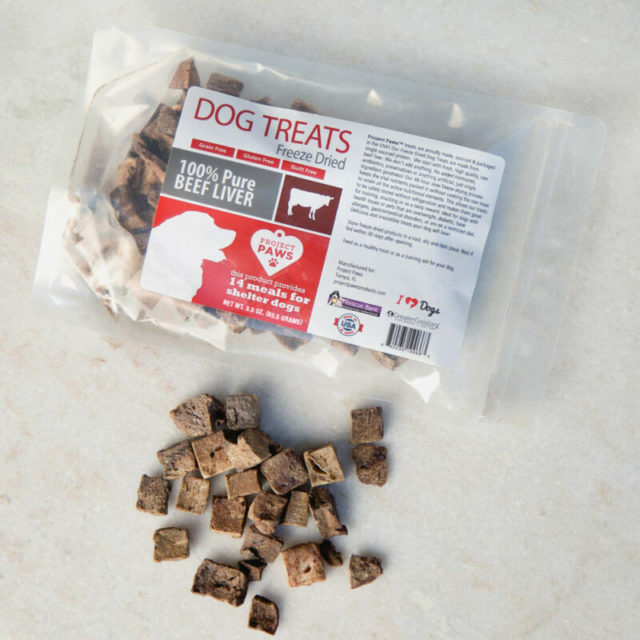 Single-ingredient freeze-dried treats from Project Paws are healthy, and with just one ingredient, you know there’s no added sugars or anything else that should stay clear of your dog’s plate. Keeping your dog’s teeth clean doesn’t have to be all work, and the rewards will always be worth it! And when you get your dog’s dental care treats and tools from the iHeartDogs store, you’re taking care of shelter dogs with meals and toys too! If you step up your dog’s dental routine, and his bad breath persists, see a vet. Consistent bad breath can be a sign of dental disease.